T-jet AERO & WING STOCKERS!!! FOR NEW MONTE CARLO STOCKERS CLICK HERE! NEW! 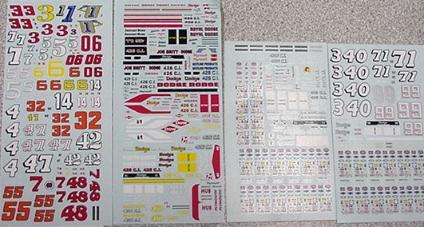 #N49 AERO & WINGED STOCKER DECALS!!! NEW!N49 WINGED WARRIOR AERO STOCKERS DECAL! LIMITED TO LESS THAN 100 SETS!!! Finally, decals for the mopar fans. 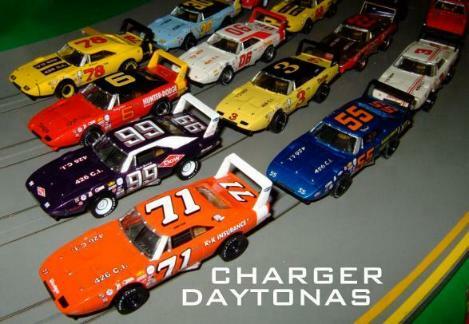 These are made for the new RRR Charger 500s, Superbirds, and Charger Daytonas. 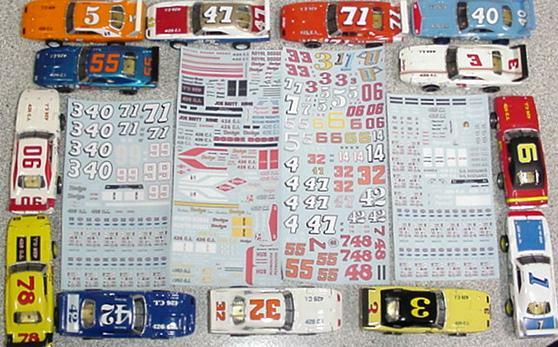 A multi-sheet decal set that have enough to do 18 different cars! 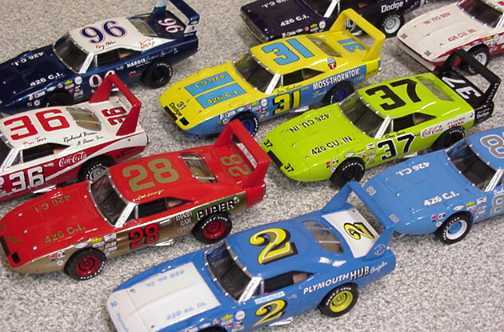 That's only $1.67 per car with many cars being made in choice of car/driver combinations and variations. With roof side panels, tail stripes, tail light panels, birds, fender sponsors, hood numbers, etc. Can be used with AFX Daytonas. 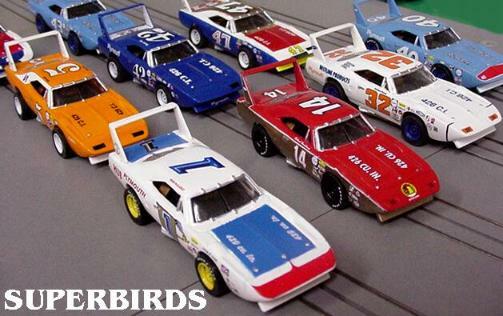 With all the great new Daytonas, Superbirds and 500's offered thru RRR you'll be able to make some of the most realistic HO slot cars ever made. These awesome decals are super accurate and only like you'll find at RRR! See the photo below for incredible details. 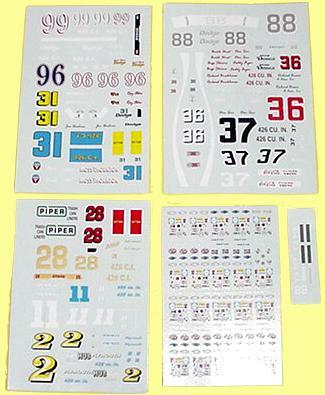 ORDER N49 at $30.00 for the set includes FREE color 2-page paint/decal photo guide sheet. 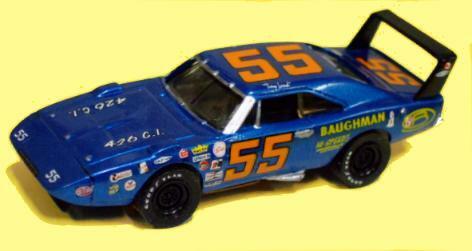 '70 DODGE CHARGER DAYTONA....Another new car to add to the RRR line of history making stock cars. This car is patterned from a T-jet charger and made to fit a T-jet. A Flower/RRR design. It has reinforced window posts, roof, and screwposts for a more durable car design (much better than Aurora's). For accuracy, it has a rear wing spoiler, front air dam, lower side pipes, filled tail lamps, side mounted gas tank, front and rear window supports and clips, window wipers removed, and even hood clips! Rear bumper is molded into the body for silver painting or foiling. 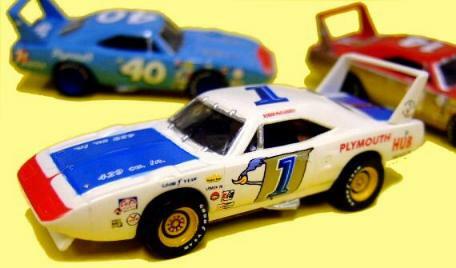 '70 PLYMOUTH SUPERBIRD....Yet another new wing car for the RRR line of stock cars. This car is a scratchbuilt Flower/RRR design made to fit a T-jet. It has reinforced window posts, roof, and screwposts. For extra accuracy, it has a rear wing spoiler, front air dam, lower side pipes, filled tail lamps, side mounted gas tank, front and rear window supports and clips, window wipers removed, and even hood clips! Rear bumper is molded into the body for silver painting or foiling. '69 DODGE CHARGER 500 A aero version of the Dodge Charger stock car before the wing cars. It is far different than the T-jet Aurora Charger. This car is patterned and made to fit a T-jet. It has reinforced window posts, roof, and screwposts for a more durable car design (much better than Aurora's). It is designed with the small rear spoler, front air dam, "fastback" style rear window, flush front grill with headlights, lower side pipes, filled tail lamps, side mounted gas tank, front and rear window supports and clips, window wipers removed, and even hood clips! Front and rear bumpers are molded into the body for silver painting or foiling. N30 Late 60's Fender Contingency sponsors Decal! #814 STEELS tire/wheel combination for stockers! ...and NOW YELLOW or RED TOO! They even come with the tires!!! NEW 3R "NARROWS" wheels for those narrow bodied cars!